1 Year - 6 issues. Incorporating Chocolatier and Pastry Art and Design, Dessert Professional, is the first trade magazine for the pastry and baking professional, and is the resource for this ever-growing, ever-in-demand pool of talented, creative and influential food artists, and a forum for the exchange of their ideas and techniques. More than ever, a restaurant's pastry chef has an impact on the bottom line, as sophisticated diners look to imaginative deserts and fresh-baked breads to round out the evening's fare. This Epicurean magazine focuses on the preparation and presentation of elegant desserts. Dessert Professional showcases dessert creations from professional chefs as well as its own test kitchens providing instructions for readers to recreate them at home. 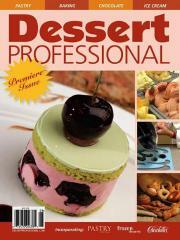 You can receive Dessert Professional directly or send a Dessert Professional Magazine Gift Subscription! Just complete our online subscription form!